Islam, Hinduism, Sufism, Gender, Civil Society. After receiving a BA in French from Vassar College, Kelly Pemberton completed an MA in international studies and religion at the University of Washington and a PhD in religion at Columbia University. Her research covers mysticism, the landscape of religious authority and authorities, and civil society in South Asia and the Middle East, especially as these relate to gender. She has co-edited a volume of essays, Shared Idioms Sacred Symbols and the Articulation of Identities in South Asia (Routledge 2009), and written a monograph, Women Mystics and Sufi Shrines in the Indian Subcontinent (University of South Carolina Press, 2010). Her work has been published in academic journals, encyclopedias, and edited volumes. She also consults on projects focusing on the Middle East and Asia for non-profit organizations, government agencies, and private businesses. 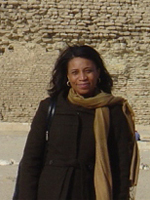 For more information on Professor Pemberton's work at GW, please visit her personal homepage or her blog, Women and Gender in Islam.